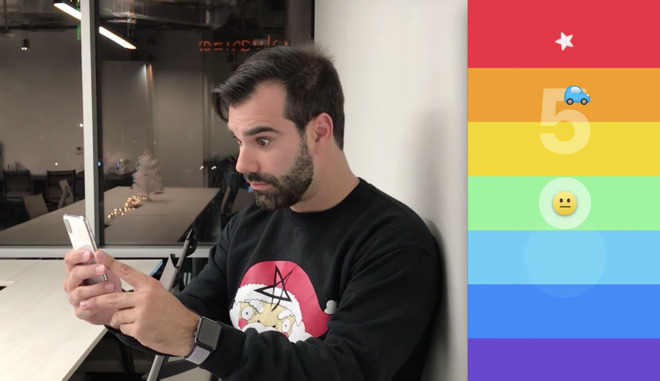 A new game made specifically for the iPhone X's TrueDepth camera is available to download from the App Store, with 'Rainbrow' using the sensor array as a game controller by monitoring the user's eyebrows in one of the more novel applications of the imaging hardware. "Rainbrow" is a relatively simple game, tasking players to move up and down a rainbow-colored play area and collecting as many stars as possible. At the same time as acquiring the stars, players also have to time their movements to avoid items crossing the screen from side to side, as a collision ends the game. Despite the minimal mechanics, "Rainbrow" increases the difficulty by requiring the player to change their expression to move the character. Raising their eyebrows in surprise raises the character up and frowning pushes it down the screen, while a relaxed neutral expression stops movement. Developer Nathan Gitter, a Washington University computer science graduate, told MacRumors he has plans to add more to the game in the future, with integration into Apple's Game Center adding the ability for players to compete against their friends. The game is an early example of developers using the TrueDepth camera and ARKit as an alternative way to directly control an app. Other applications of the technology have largely revolved around adding masks to the user's face or mapping facial movements to animated characters, such as Apple's own Animoji. Privacy concerns have been raised about developers using the TrueDepth camera, with apps being allowed to access "certain facial data," due to the possibility of it being collected and used for other unauthorized purposes. Apple already prohibits developers from using face data for advertising or marketing purposes, and from selling the data on to other companies. Also, Apple only provides a smaller subset of data collected by the sensor array to other apps, while keeping the more sensitive data used for Face ID separate and protected within the Secure Enclave. "Rainbrow" is a free download from the App Store, measuring 15.1 megabytes in size, and requiring an iPhone X for gameplay.